"The 1997 A.L. Brown Wonders"
On December 12th 1997 The A.L. Brown Wonders of Kannapolis defeated the Northeast Guilford Rams 34-12 at Kenan Memorial Stadium in Chapel Hill to lay claim the their second 3A State Championship in school history under coach Bruce Hardin. 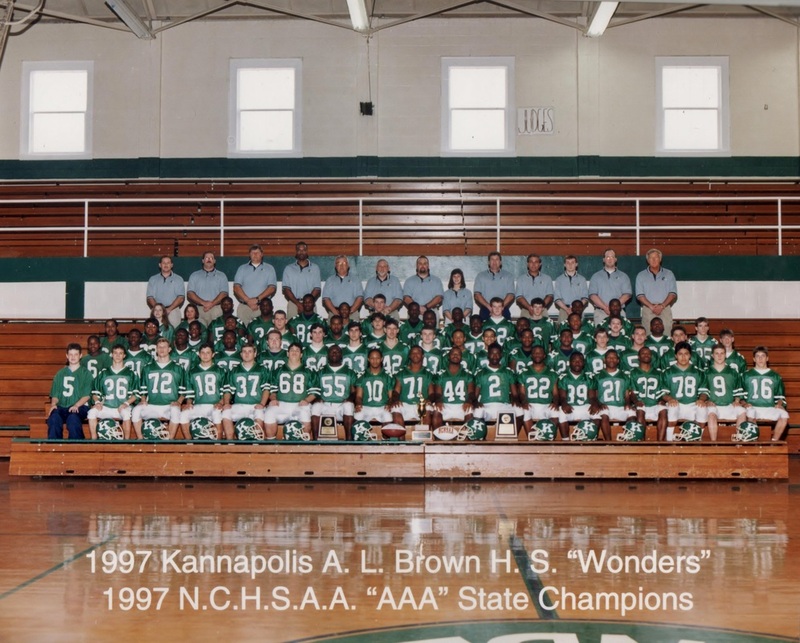 The Wonders were led by a very special running back in Nick Maddox who set four state championship records that night on his way to capturing the 1997 North Carolina High School player of the year. Maddox set several state championship records that night which included longest pass reception for a touchdown (98) yards, Most touchdowns scored by a single player in a state title game (four), Longest run for a touchdown in a state title game (68 yards), and Most rushing yards by a single back in a state title game with (197 yards), finishing with 321 total yards of offense. Maddox earned offensive mvp for the 1997 state title game, and would go on to his senior season as one of the most highly recruited backs in Wonder football history, but this is only part of the story of that state title team. The 1997 State Champions quest began some fourteen games prior after coming off a dismal showing in 1996 that was anything but the Wonder standard. The Wonders set out on their quest during the long hot days of practice in early August until the final seconds ticked off the clock on a cold night in Chapel Hill. This is the story of team who stuck together through the joys of winning and through a lone stumble in late October that set about a series of events that would ultimately define this group of state champions as one of the greatest Wonder teams in Kannapolis football history. "Bringing the Fun Factor Back to K-Town "
Coming off a very tough year in 1996 the Wonders of A.L. Brown High School wanted nothing more than to rid their mouths of the bad taste still lingering from a dismal 6 and 5 showing. In the words of one of those players "We just didn't have fun last year" An understatement to say the least, and how could they. It had been 19 seasons since the Wonders ever came this close to falling under 500%, but this was not a typical year as the 1996 team just failed in every aspect of the season to find that winning chemistry. A 1996 season that would find many of it's players returning in 1997. There was nothing at that time to indicate to the average Wonder fan that the elements for a state title contender were present with this group, and any betting man in Vegas would have told you the same thing. "1997 Pre Season Football Rankings by Classification"
Call it intuition, Call it blind faith or call it throwing your sticks into the wind, but somebody had the faith to believe that 1997 was going to be special for the Wonders who had them ranked #5 in the 3A classification at the beginning of the year. "The Charlotte Observer's Sweet Sixteen for Week #1 of the 1997 Season"
After just three outings in the 1997 season Wonder Runningback Nick Maddox begins to make waves in the SPC, and proves he will be a force to reckon with as the weeks go by. Maddox who had already amassed over 400 yards rushing in just three games proved he was well on his way to making history in K-Town and all oponents could do is prepare gameplans based soley around him to keep the Wonders at bay offensively. "Craft Becoming Vital in Wonder Success"
At the beginning of the 1997 season as with every season the first thing a fan looks at when it comes to their favorite football team is Who will lead this group at the QB position? In the case of William Craft he was basically unproven, and virtually unknown and to a fan that can be quite menacing when you're hoping for a successful year and a deep run into the playoffs. By successfully following the Wonders through the 1997 regular season finishing 10 and 1 you have now qualified for the 1997 State AAA playoffs. Beating Concord 33-14 in the Battle for the Bell Game was a very gratifying moment however after losing to East Rowan in the regular season you have just been thrown into a three way tie for first place in the SPC, and are forced to draw for seeding positions with Concord, and East Rowan. With lady luck not being very gracious you have now pulled the 3rd place spot out of the SPC landing the 13th seed out of the west, and are now looking at a very tough first round playoff game at Asheville High against the Cougars. Its a long ride, and it's very cold. Continue now to the "97 State Champs Continuation" page to see how things will pan out. Best of luck Wonders.